Seth Meyers has been manning the 'Saturday Night Live" Weekend Update desk alone for years, ever since the 2009 departure of Amy Poehler. This fall, however, he'll be joined on WU by new cast member Cecily Strong. She's probably best known for her visits to the newsroom as "The Girl You Wish You Hadn't Started a Conversation with at a Party." As for The Girl You Wish You Hadn't Started a Conversation with, it's prob safe to assume that she died somewhere, mid-conversation. 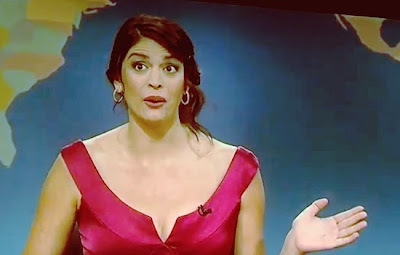 Clearly the Powers That Be at "Saturday Night Live" have a lot of confidence in Strong, as her co-hosting stint may just be a training period for her to go solo when Meyers leaves in February. (The longtime "SNL" writer and Update anchor has a brand new gig at NBC, taking over the "Late Night" spot from Jimmy Fallon.) I personally would love to see Taran Killam take Seth's spot next to Cecily next year; the two could become a weird and wonderful duo that would add a much-needed spark to the currently creatively-struggling show. What do you think, "SNL" fans? Does Strong seem like a good choice for Weekend Update? The new season of "Saturday Night Live" premieres Saturday night, Sept. 28 at 11:30/10:30c. You might also enjoy: My "Saturday Night Live" gossip and recaps at Yahoo! omg! PHOTO: "Saturday Night Live" Weekend Update with Cecily Strong screencap, NBC, fair use.